Fabrizia Maurizia Lemmo and Michele Massi are two Business Administration majors and Entrepreneurship minors, both expected to graduate in Fall 2017. Fabrizia has worked as a student assistant in the Library and is currently working at the Institute for Entrepreneurship. Michele has worked in the Health & Well Being Office and has recently completed an internship at Crawford & Company Inc, one of the world’s largest independent providers of claims management solutions to the risk management and insurance industry. Both students are part of the JCU Business Club. Together with Carol Spizzichino and Lisa Cheng, they recently presented a business plan to BoxEventi Italia as a class project for Professor Riccardo Maiolini’s BUS 410 class. 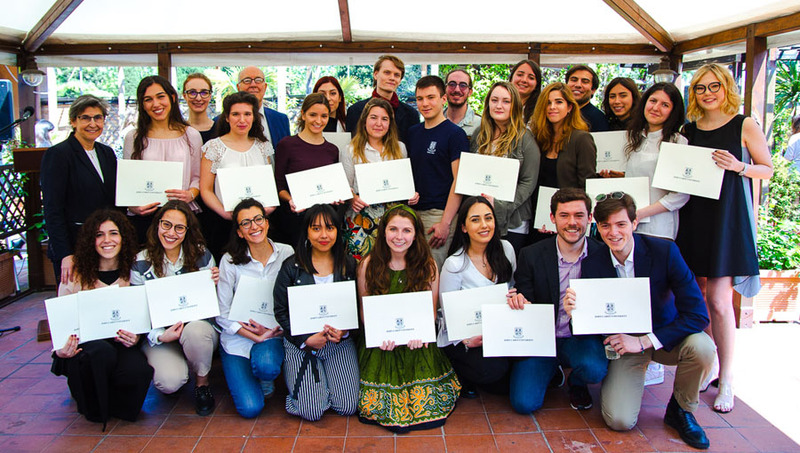 M: Within the Strategic Decisions in Entrepreneurship course (BUS 410) we had to develop a business plan for BoxEventi Italia, one of the few companies that organize big events here in Rome, such as the Maker Faire, Body Worlds, and the BNL Internazionali di Tennis. Professor Maiolini divided us into groups and gave us two months to prepare a business plan. We pitched it directly to the company. They picked our plan as the best one and they offered us a summer internship. F: Companies are invited to the class as part of the Learn Do Share initiative to collaborate with students on selected topics. BoxEventi Italia asked us to find a new target market for international customers traveling to Italy and we decided to focus on Chinese tourists. How did you target the tourists? F: At first we didn’t think about Chinese tourists specifically, we wanted to focus either on the American market or the broad Asian market. Then, Professor Maiolini led us in a more specific direction and thanks to Lisa we were able to contact some agencies in China that deal with tourists here in Rome. M: I think what the company liked about our plan was that we had something concrete to bring to the table. It was a very tangible project. M: BoxEventi Italia organizes events in Rome and all over Italy. The next big one I think will be Let’s Play, the video game fair in Rome. F: They specialize in customer relations and provide assistance every step of the way in preparation for the event. What will the internship be about? M: We were asked to take the business plan from power point to reality. Many agencies in China are ready to collaborate with us thanks to Lisa’s contacts, so we are ready to start anytime. M: I plan on getting an M.B.A., because it is my major and I would like to continue with it. In the future I would like to specialize in Entrepreneurship, because I noticed how much of it you can apply to real life, especially here in Italy. It is definitely something I would like to continue pursuing. F: After graduation I would like to start working and gain some experience in the Entrepreneurship field. I would like to pursue a Master’s in Marketing or in Business Administration as well. Why did you apply to JCU? M: I studied abroad in high school and I decided that I wanted to continue studying in English. I also knew that I really wanted to study Business. I decided that JCU was the best fit for me. Do you have any advice for a new student starting at JCU? F: Don’t be shy. Try to take advantage of all the opportunities the university offers. Your senior year will arrive before you know it, and you might think that there is still so much to do and very little time to do it. Remember that it is never too early to do something. M: Participate in a lot of extra-curricular activities, because that’s where you meet people who are interested in the same things you are. Don’t miss out on the opportunity to network with people outside of the university as well, as this could be the first step towards building your future career.